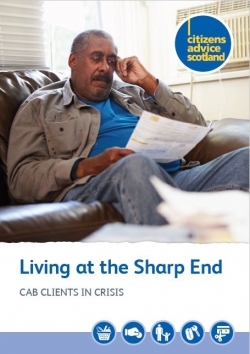 This report, ‘Living at the Sharp End: CAB clients in crisis’, looks in detail at the causes of gaps in income, particularly with regards to the benefits system; the impact of gaps in income on CAB clients; and the adequacy of existing crisis assistance provided by statutory agencies. Based on the findings of this research, the report recommends changes that could increase people’s resilience to income shocks, help to prevent gaps in income and improve crisis assistance. Citizens Advice Scotland’s intention is to present CAB evidence in order that we can work constructively with stakeholders to prevent anyone from experiencing a period of no income, and ensure that adequate crisis assistance is available when things do go wrong.